Oh, the final day of a rocking conference. The flamenco music has just faded out and Liana Evans is now on the stage. She says that every time she hears our speaker talk she always has awesome takeaways. 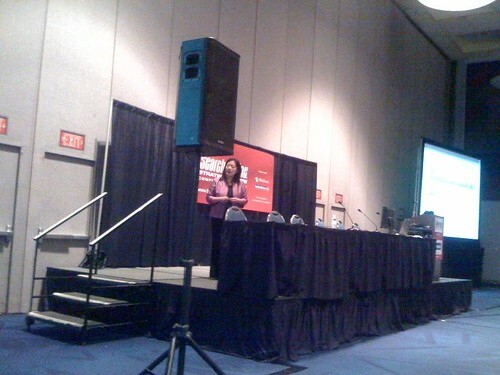 Li’s speaking of Charlene Li, co-author of Groundswell and founder of Altimeter Group. Charlene steps up to the podium. Think of how far search has come in the last 10 years. Search results are much richer today. Imagine how much more things will evolve. She shows a screenshot of Bing and highlights the left-hand table of contents. Search is much more sophisticated than before. The Groundswell is where social technologies enable people to get what they need from each other. You can watch videos, listen to audio, connect on Facebook, check what people are saying in real time. In search, the Groundswell has had an effect, and she points to United Breaks Guitars as an example. After a year of fighting with an airline, a man got fed up and put a video up that told his story. If you do a search for United today, the music video is the fourth result. United doesn’t own their brand as a keyword anymore. Social is out there and it’s being picked up, including by search engines. People must be at the center of your search strategy — not keywords. So how do you do that? Look at content meaning and advertising through the lens of people. If you think of relevancy as where content meaning, advertiser intent and user intent come together. Search engines today can’t make much sense of social sites. Partly because there’s a registration wall and partly because it’s not link based. Take a look at Starbucks’s Facebook fan page. They have 3.7 million fans. Starbucks recently posted on their wall about their Red Foundation pledge campaign. This post had more than 600 comments and more than 7,000 “likes”. And these likes and comments don’t only stay on this page — they’re shared with those users’ friends. The Facebook search feature lets you know what other people in your network have said about things. And there’s no capability for search engines to tap into this. Social networks will be like air. It will be all around you, at your fingertips, not just on your desktop computer. User intent becomes clearer with geographic, time and social context. Now you can use your smart phone to search nearby, search on route, search by time of day, find places with friends’ reviews or even friends nearby. 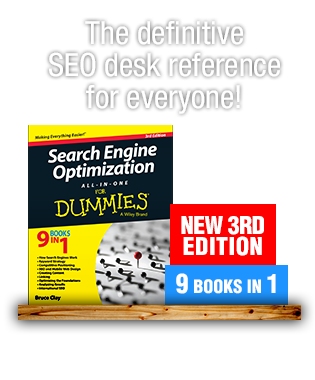 How does that change the parameters of what search actually requires. User intent becomes more than the words, it becomes the context. What if you could read reviews from people you know? If there’s a way to filter by friend reviews first, or friend reviews from only foodies if you’re looking at restaurants. Check out what Earthwatch is doing with trip reviews shared between friends. What could you do if you could understand user intent better? Media6 identifies who is closest to you — your network neighbor. The idea is that friends have something in common. Friends, more than anything, is the most reliable indicator of interests. Media6 maps network neighbors based on visits to profile sites via browser cookies (no PII involved). If Jane buys shoes on NineWest, NineWest ads may be shown to Lisa’s friends, without identifying or involving Jane. The key is tapping into the social graphics, creating profiles, which advertisers can use to target. This information can inform the advertiser how valuable a person is to you as an influencer. 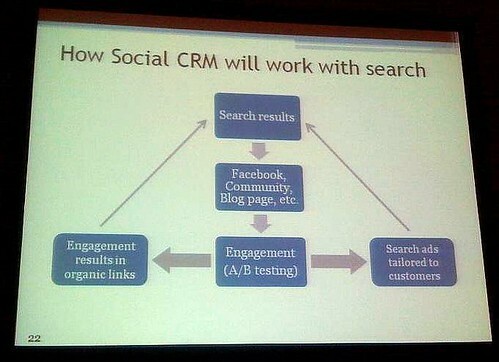 How will social CRM work with search? So how does a business prepare? 1. Focus on the people not the keywords. It’s about the long-term relationships. Let that inform your interactions with your audience. Focus on relationships, not technologies. What kind of relationship do you want? Do they look transactional, occasional, impersonal and short-term? Or passionate, constant, intimate and loyal? Goals define your strategy. The first goal should be to learn. This happens through listening to customers first. Then engage them in a dialog, help and support them, and/or innovate with them. Learn with monitoring tools. Search for free with Twitter and Delicious to see how people are describing and using a product. A paid tool is Radian6, which gives you all kinds of information about product/brand mentions. You’ll see where the conversations are taking place and who is influential in the conversation. Along with listening, encourage feedback. The first level is the watchers. The level after is sharing, and that actually involves engagement. Then come commenters. These people actually create content through their shared opinion. Next is producers — people who create content for a specific audience. Charlene is a blogger and she has a very clear idea about who her audience is. She’s not going to share a post with them about her family vacation, but they will care about her thoughts on technology. 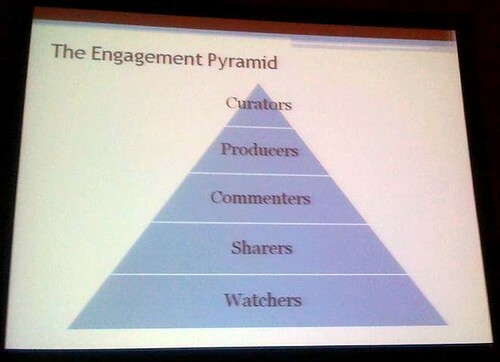 At the top of the pyramid is curators. These people can’t function without the permission of the rest of the community. So where should a business be? The top? Nope! Pay attention to the bottom of the pyramid. You need to start from the beginning where you’ll draw the movement. Think of where sharing and commenting can be integrated in you site — where they’ll make the most sense and where they’ll be the most utilized. 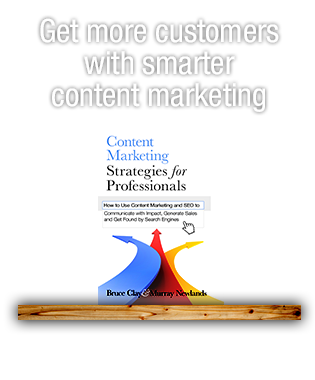 When the right tools are available, anyone can be a marketer on behalf of the company in the future. This scares companies. But the time of fear is past. You have to find the people in your organization who can speak on your behalf and give them the right tools and training. Look at Dell’s Twitter account. It’s not push marketing — it’s dialog and conversation and customer support. Or look at the @comcastcares account. Someone doesn’t even have to contact Comcast. A mention of a bad experience elicits the company proactively reaching out. More innovation can be seen in Starbucks’s automatic ordering via swipe card idea. Starbucks has been thinking of how to make it work for the last year. They weren’t able to make the idea happen, so they posted that the technology is an issue and explained their decision making process. That gives customers validation. 2. Get your backend data in order. Single sign-on and identity record. Integrate off-site behavior and data. Know influence of key people. 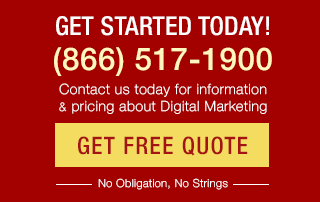 Integrate social into your site. Facebook Connect is an easy way to do this. People will bring their social network into the site. LinkedIn also has this ability. Think of where your audience connects with their friends. Prepare to tap into “chain of intent”. If you search for “family vacation” and then “cruise” and then “family vacation again” — the third search will show ads that account for cruises. How good is your ability to analyze this information on the fly and return information based on that? 3. Be ready to give up control. The biggest barrier companies have in adopting these technologies is not wanting to give up control. How many of your personal relationships do you control? You don’t. You build up trust over time. And if you think of what control you’re giving up, you realize control is a fallacy. Social networks will be like air. Your social network will go everywhere with a user. People must be at the center of your search strategy — not keywords. Deepen relationships with social technologies. Be ready to give up control — you have no choice. Find her on Twitter @charleneli and read her blog at blog.altimetergroup.com. Great wrap-up Virginia, thanks for making it so easy on those of us that can’t make it out for the conference.